Angie has been an SGT Ensemble Member since 2011. Her previous credits include: In the Heat of the Night (Noreen), The Whaleship Essex (Nickerson), Mill Fire, Romeo and Juliet, Orpheus Descending, and Her Naked Skin. 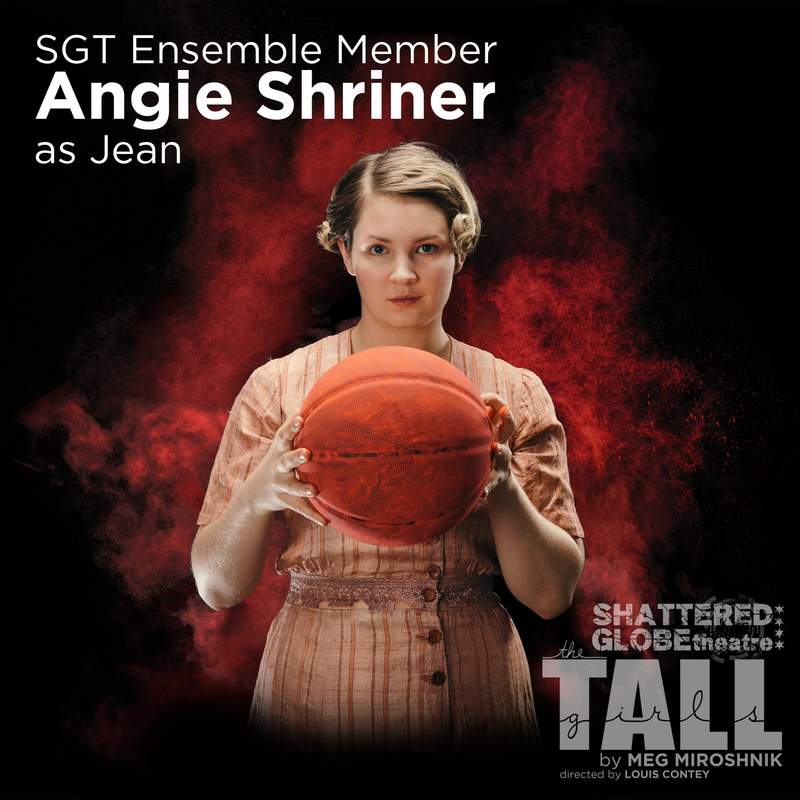 She is featured in SGT’s production of The Tall Girls by Meg Miroshnik, playing the part of Jean. We asked her some questions regarding her experience with the process and the art of learning a new sport. I was in a basketball summer camp in 4th grade. I remember that camp had pretty tasty sports drinks, which was a huge incentive to go. Suffice it to say, I didn’t invest much in basketball after that summer. But, once I found out I was cast as Jean, I definitely started hitting the court to figure it all out. I retained some things, but it was definitely easier to learn as a kid! I certainly appreciate the sport more. I was always fascinated by basketball. I grew up watching the Bulls. And, of course, I loved Space Jam and Jock Jams! YES, yes, yes, absolutely. There is nothing more unpredictable than not knowing whether I will make the shot. I am doing my best to accept the idea of the unknown…in front of a theater full of people. I am trying to embrace the fact that I truly never know what will happen. It’s exhilarating. There’s risk involved with every performance. There is the potential for something different every time. That feels very human to me. That’s exciting. That’s real life. What are some of the most interesting things you learned as a result of doing this play? About girls’ empowerment? About teamwork? There is a reason they say teamwork “makes the dream work”. It’s cliche, but true. Jean is a deceptively tough character to play. She is wise beyond her 15 and a half years, and equal parts compassionate and strong. Every night is a fight for my life, beliefs, and future that requires battling some very intense demons onstage. I suppose I’ve learned, personally, that I’m stronger than I ever imagined. Jean forces me to abandon my desire to be liked by an audience, and gut myself in every scene. I don’t know that I fully got to explore those parts of myself before The Tall Girls. I learned during this show that I have an incredible support system which makes it easier to bare your soul! I’m incredibly grateful. The Tall Girls by Meg Miroshnik plays January 12th-February 25 at Theater Wit (1229 W Belmont, Chicago, IL). Single tickets are available via the Theater Wit Box Office. More info about Season Traveler Memberships–the best way to see all three shows in SGT’s 2016-2017 Season–are available here.